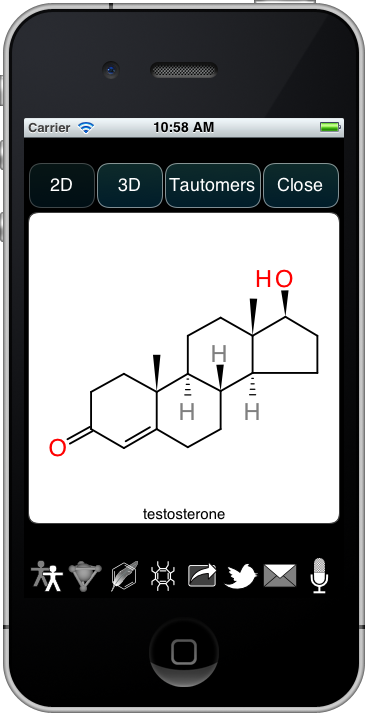 The basic interface is simple: about 1300 drugs are contained within the app itself, and when the app starts, they are displayed onscreen, in a list that can be scrolled up and down. Each entry in the list is a nicely depicted 2D structure diagram with a name underneath. The data itself has been compiled from a variety of sources: much of the data was kindly provided by Antony Williams (of ChemSpider fame), and 3D conformations have been incorporated from the e-Drug3D collection. Many of the structures have been depicted using the 2D depiction algorithm that is a part of MOE. A certain amount of judicious manual curation, automated algorithmic sanity checking and cross-comparison with public databases has been applied, which in itself is an ongoing project. The conformation for the structure can be viewed using touch gestures – drag to rotate, pinch to zoom, and two-finger drag to move. 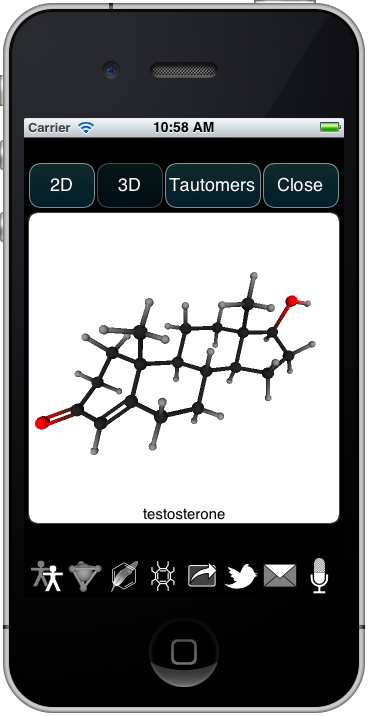 For structures that have tautomeric forms, these can also be viewed in a separate tab. 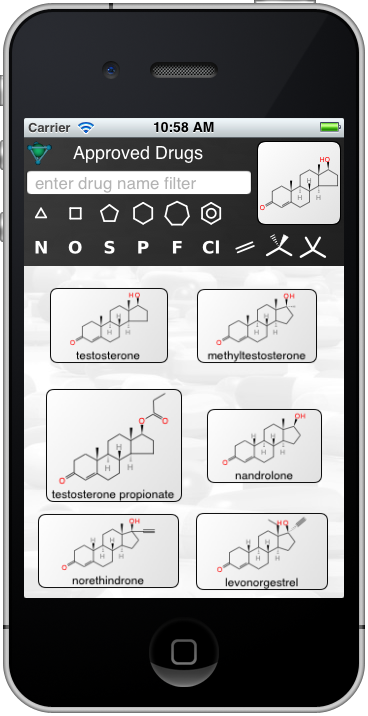 From the main menu of the app, there are several ways of locating drugs of interest, since >1300 is too many to browse. Drugs can be searched by name. They can also be filtered by certain substructure features, e.g. the presence of ring sizes, heteroatoms, aromaticity, and the presence of defined or undefined chiral centres. It is also possible to edit or paste a structure, which will cause the list to be sorted based on structural similarity, which is calculated within the app itself – no need to outboard it to a cheminformatics server. If all goes well, the app should be on the store in a week or so. This one’s not free, though: it has some pretty cool features in it, with plans for more.